Written by a leading developer and maintainer of the Linux kernel, this book offers you a comprehensive overview of kernel configuration and building a critical task for Linux administrators and developers. Because no distribution can provide a Linux kernel that meets the needs of all users, computers big and small have special requirements that demand reconfiguring and rebuilding the kernel. Linux Kernel in a Nutshell explains how to get the behavior and performance you want from Linux. 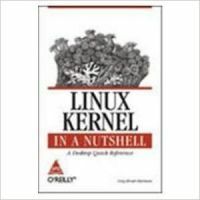 This book focuses on version 2.6 of the Linux kernel, which has brought Linux into the heart of corporate IT environments with significant changes in nearly every subsystem, particularly in the areas of memory management and block devices. With its ability to run on systems ranging from handhelds to mainframes and its support for both desktops and servers, this kernel is supremely flexible. But sometimes it needs help from the user and that's where this in-depth reference comes in. With it, you'll learn: The entire range of tasks in kernel building and installation, starting with downloading the source. Guidelines for making sure your tools are in sync with your version of the kernel. Reference material and discussions of related topics, such as control of kernel options at runtime. Recipes that list what you need to accomplish a wide range of tasks. The Linux kernel has drivers for nearly anything you can connect to a computer and one key advantage of this book is found in Chapter 8, which shows how to determine exactly which drivers you need for your hardware. Greg Kroah-Hartman has been building the Linux kernel since 1996 and started writing Linux kernel drivers in 1999. He is currently the maintainer of the USB, PCI, driver core and sysfs subsystems in the kernel source tree and is also one half of the stable kernel release team. He created the udev program and maintains the Linux hotplug userspace project. He is a Gentoo Linux developer as well as the co-author of the third edition of the "Linux Device Drivers" book and a contributing editor to Linux Journal. He also created and maintains the Linux Device Driver Kit. He currently works for SuSE Labs/Novell, doing various Linux kernel related tasks.